When applying for a nonimmigrant visa, you are required to upload a digital photograph taken within the last six months as part of completing and submitting the Form DS-160. You should also bring a copy of your photograph to the Embassy on the day of your interview. You will also be fingerprinted when you arrive for your interview at the Embassy. 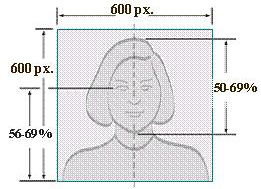 is important when taking your visa photo. Frame yourself within the photo so that your full face shows. Face directly toward the camera and make sure your eyes are open. across your face or in the background.